Today is truly a Design Wall Monday! My wall is full of Kaffe Kisses... 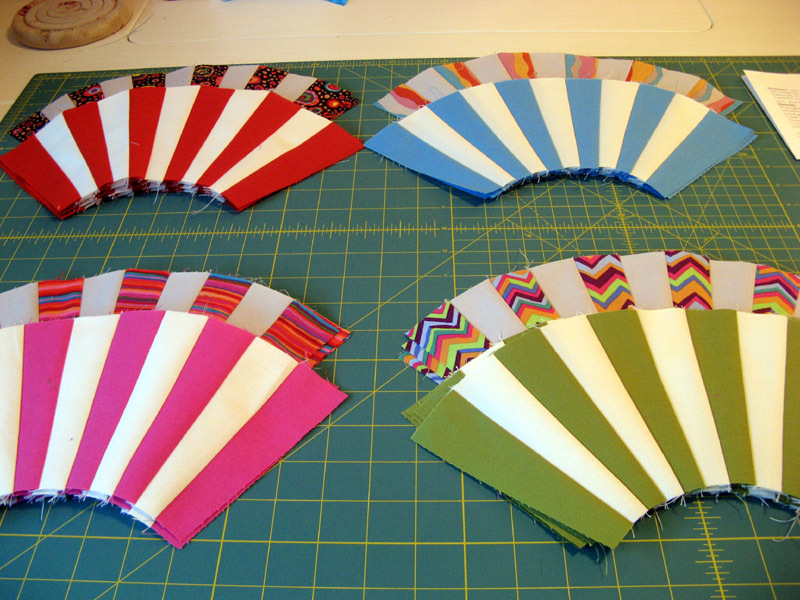 I have yet to decide on an arrangement but all the units are sewn. The next step is deciding on the arrangement then continuing with the sewing. There is still trimming involved too. 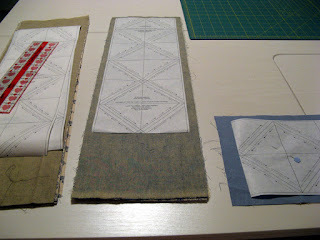 I found the tool you see excellent for lining up the edges for the curve seams of Step 9 in the process. 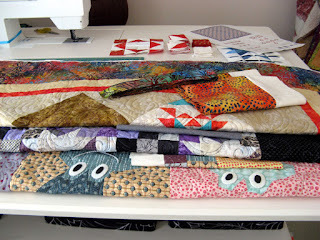 As mentioned yesterday here is where I am with the many "in work" projects that grace my sewing room. Are you ready? Let me start with Kwill that has been completed. 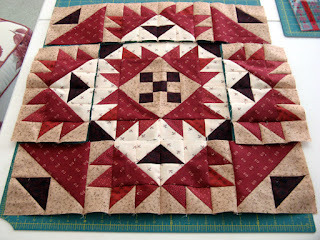 This is my first feathered star project. I've done a couple of others, but they were for other projects not mine. You can check out the making of Kwill (and any other in work projects) through the Label on the right side bar. I can see the possibility of more feathered stars in my future. Earlier in the week I took on part of a project for my friend Bonnie. She's hoping to get this Judy Niemeyer project complete for her Mother-in-Law this year. 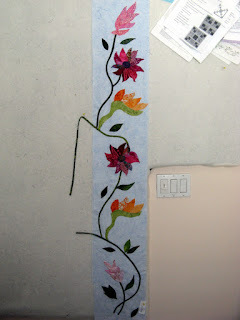 This is the bottom outside border of Judy's Flowers for my Wedding Ring design. I finished all the vines and leaves on my piece. 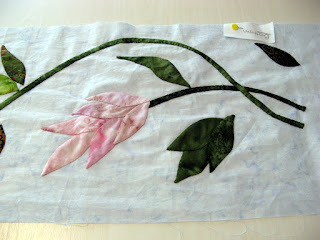 Thursday evening the light pink flower finished. DeLinda is helping too. Between the three of us this project will be done before her Mother-in-Law's Birthday rolls around again. 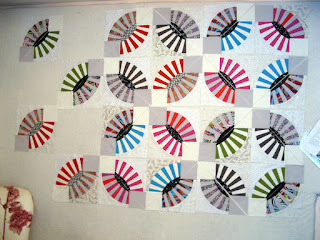 This last weekend of February my attention was turned to completing my BOMs. My second one Kalvery was done on Saturday. It was much the same as January two large blocks and six smaller blocks. 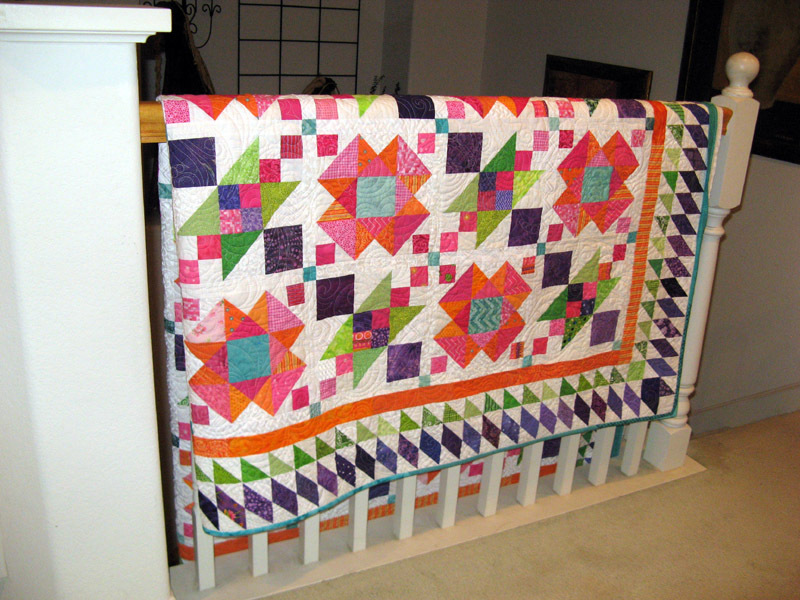 The large blocks are 12" and the smaller ones 6" finished. 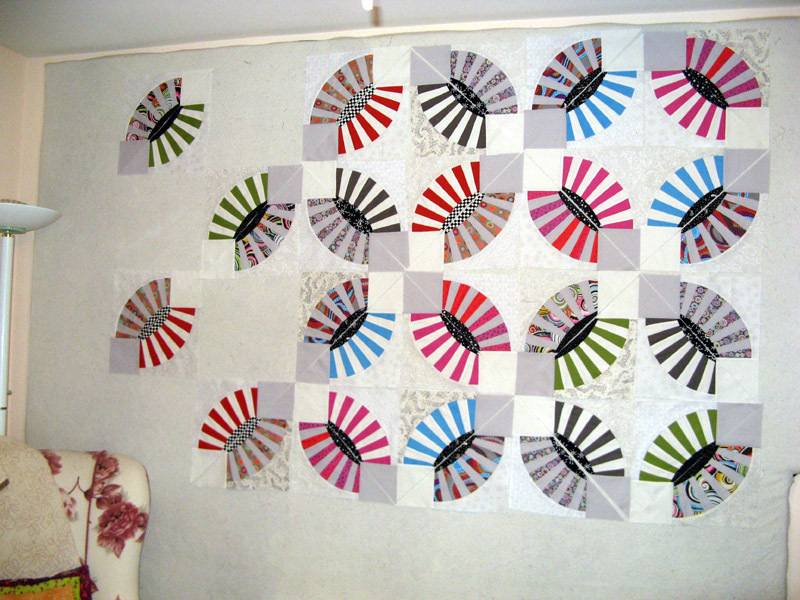 Once the design wall is available I plan to layout the pieces done so far to see how it is looking. The third and last of the February BOMs to finish is Kanton Kull. This was the start of February's "Chapter". It is a 12 month series, but instead of each month where a block is produced, this project's segments are rounds. 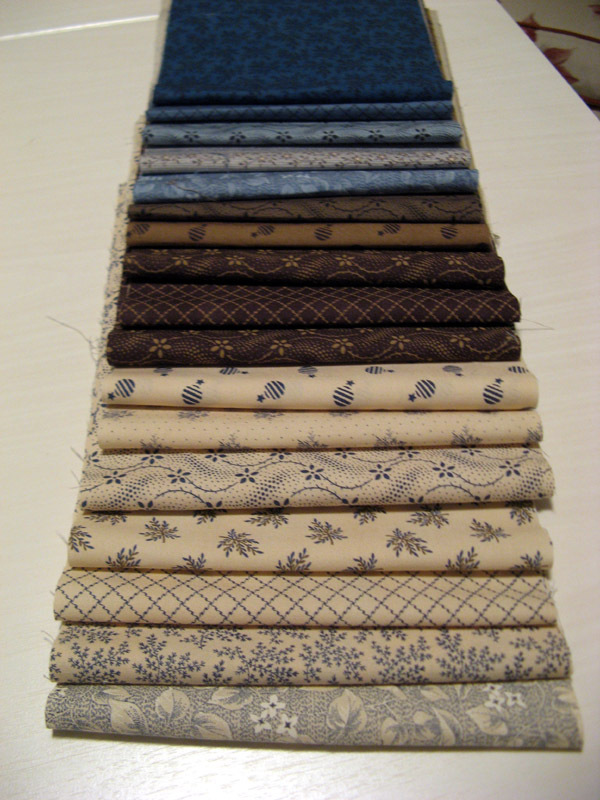 The fabrics on the left are for February. 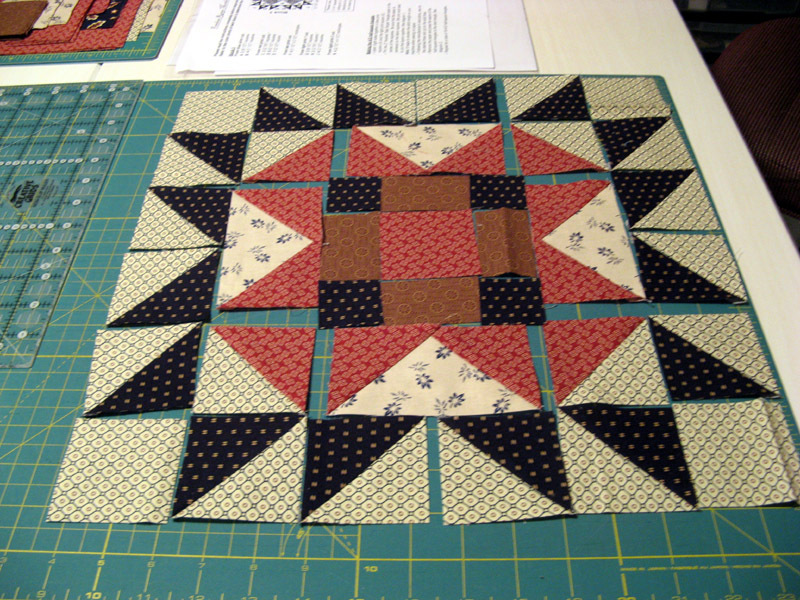 The block on the right is Chapter 1. This project is heavy cutting; not to mention precise unit measurements. 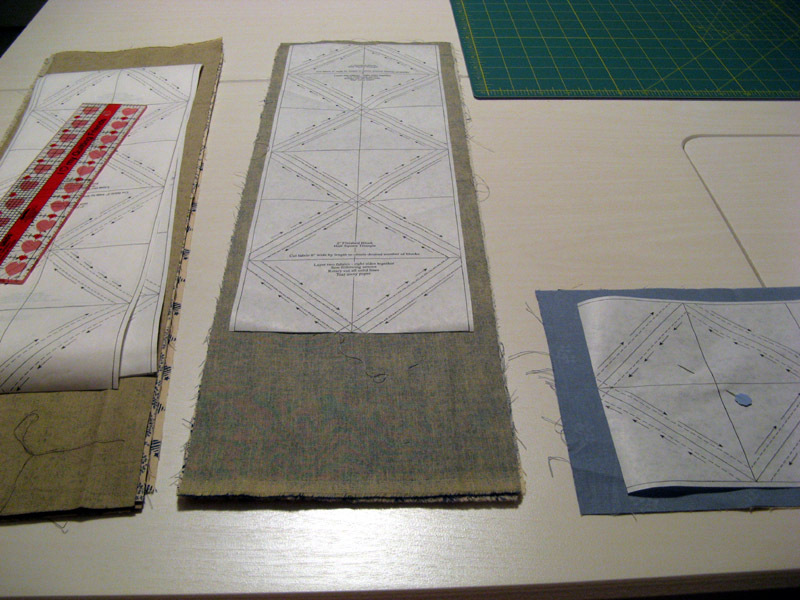 Before bedtime last night the Delectable Mountain blocks were assembled and ready for the final seams of Chapter 2. I will be finishing this up today. 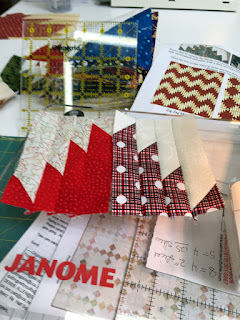 Don't you just love the red fabrics? Just wait to you see all of them! No change to stash this week. I have so much happening in my sewing room that finishes might take awhile...but that's the enjoyment...working on each of them. Visit tomorrow for a view at all the projects I have in work and just where they are in their process. Link into Patchwork Times if you have time. I spent much of the day cutting and trimming. 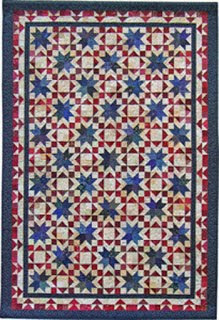 These are Block 4 and the 7-12 small stars. I did get the pieces together for Block 3 of Kalvery. 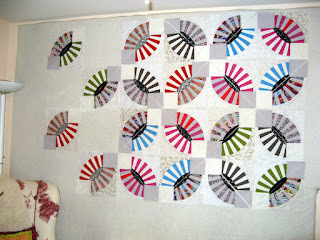 I trimmed down the wedges of Kaffe Kisses and the next part which is the melon. Here is where I have managed to sneak in my cats. They are usually never very obvious. By the time the units have their final trim they will be undetectable! We have started the second season of Outlander on Netflix. I just love listening to the Scottish accents. 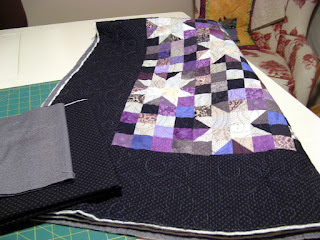 Time for binding...first up is Kwill. 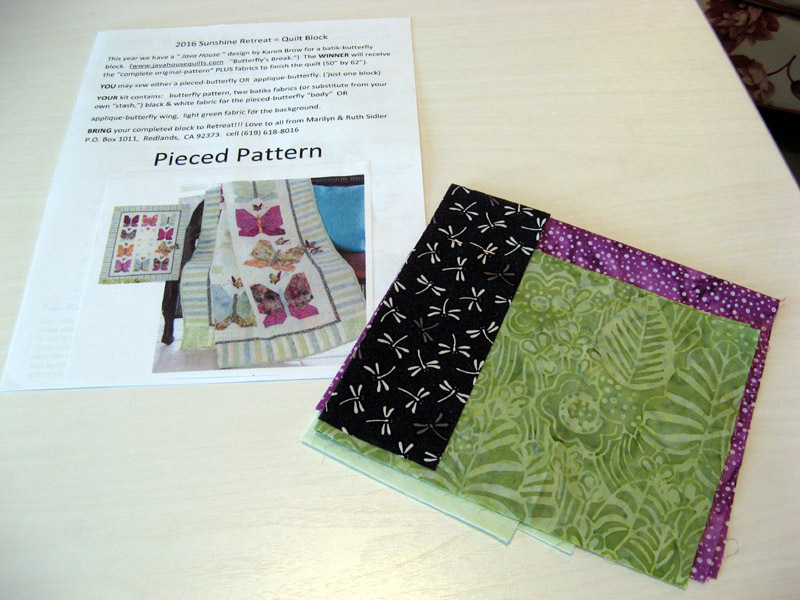 Lots more to look at today through the links of Patchwork Times. Enjoy your week. I am back to working on Kaffe Kisses. These units were the last of them to assemble. Next up is the trimming and sewing on of the black/white melon. There has been no progress on the wall since it was last shown. 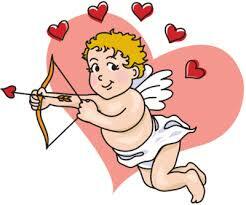 Kalvery Month 2 will be cut out today. My plan is to finish my second BOM that I'm putting together with Kerry before the day is out. I do have a change to my stash stats this week. 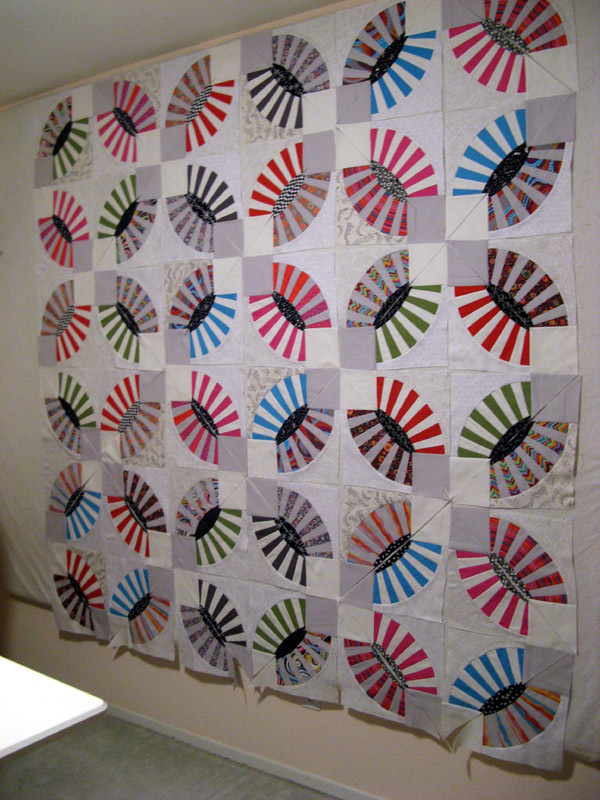 Konstellation and Krown was finish during the week my February UFO with 52quilts.com. I am anxious to see a change in my net. It is time to get out of the red from all my purchases in January. I have a UFO finish today. 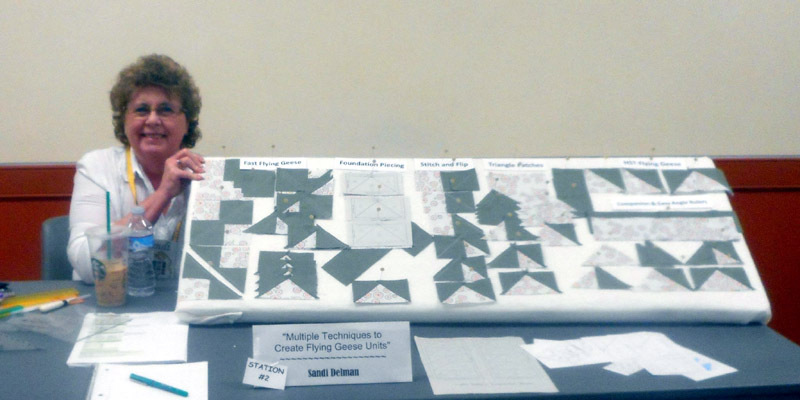 This is Konstellation and Krown my 2016 February finish. It is a project entirely from my stash. Just love finishes like this. It is a design by Pat Speth called Star and Crown in her Five Inch Is a Cinch series. I pieced together the back too with all the leftovers. This is just half of it (the fold is on the right side). 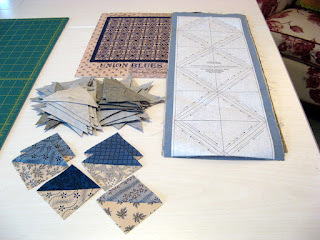 The original design called for an outer border of blue, but I plan to bind it in blue instead. Now let's see...shall I draw a straw...what project should I concentrate on next? Enjoy your week as we move into the last half of February! I've been busy this past week. 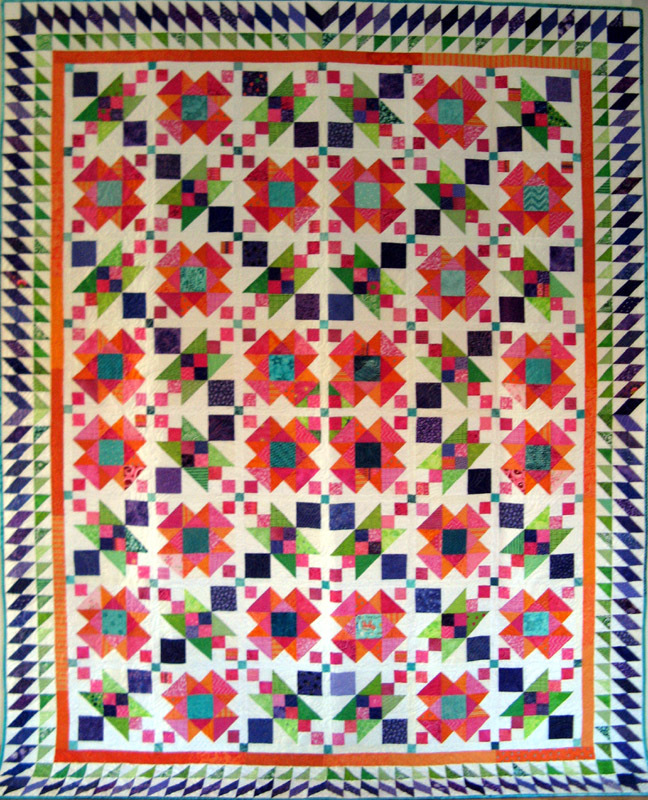 Starting first with a demonstration at Sunshine Quilt Guild on "Multiple Techniques to Create Flying Geese Units". The three 15 minute demos went very well. I prepared visual aids to explain six of them. 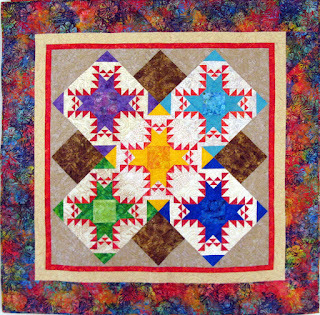 Sunshine Quilt Guild will once again participate in a multi-Guild Retreat in May. This year my Mom and I will participate for the first time. 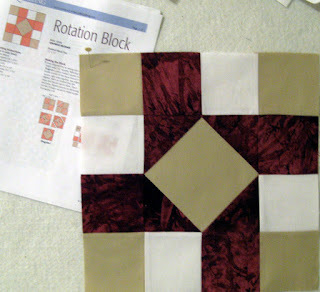 One of the participants from our guild has assembled a BOM that is either a pieced or applique block. 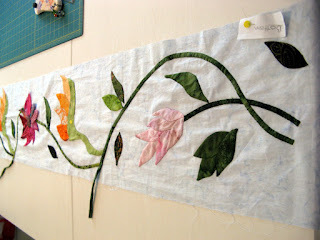 Mom will get the pieced and I will do the applique. 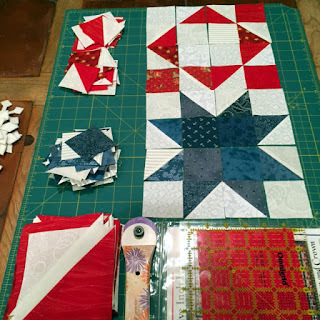 Wednesday had me working on Konstitution Month 2 HSTs. I have them all sewn. Need yet to cut them apart from the Triangles on a Roll paper, trim the ears, finger press open, and iron. 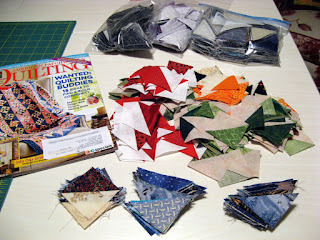 Thursday evening I was gathering the supplies for Scrappy Mountains Majesty workshop on Friday. It is great to see my friend Bonnie when she's out lecturing and teaching. These were the first of the units assembled. 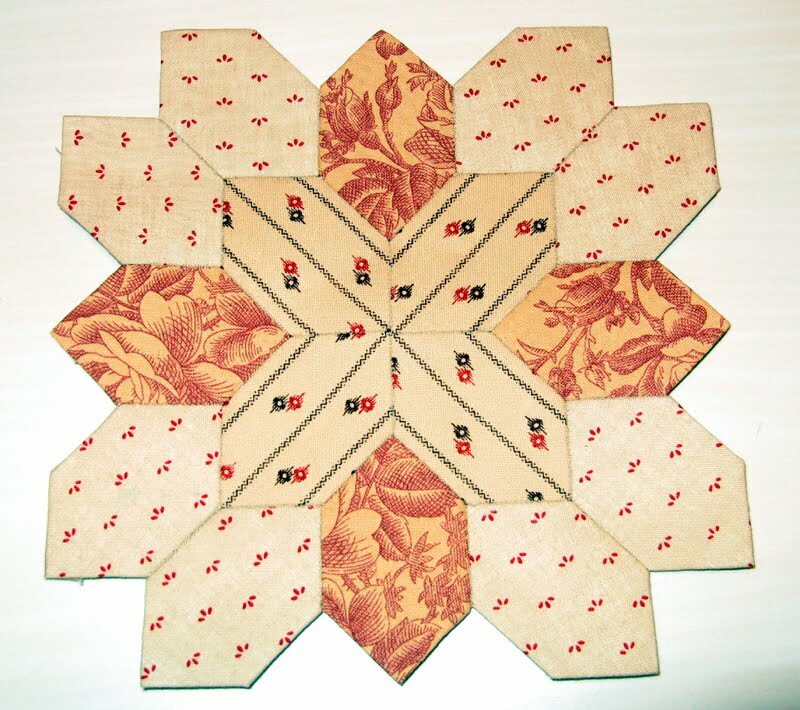 The pattern calls for a starting block of 8". Mine started out at 5". I am using HSTs from a swap I coordinated a while back. It is real nice to use these and how convenient for this pattern. 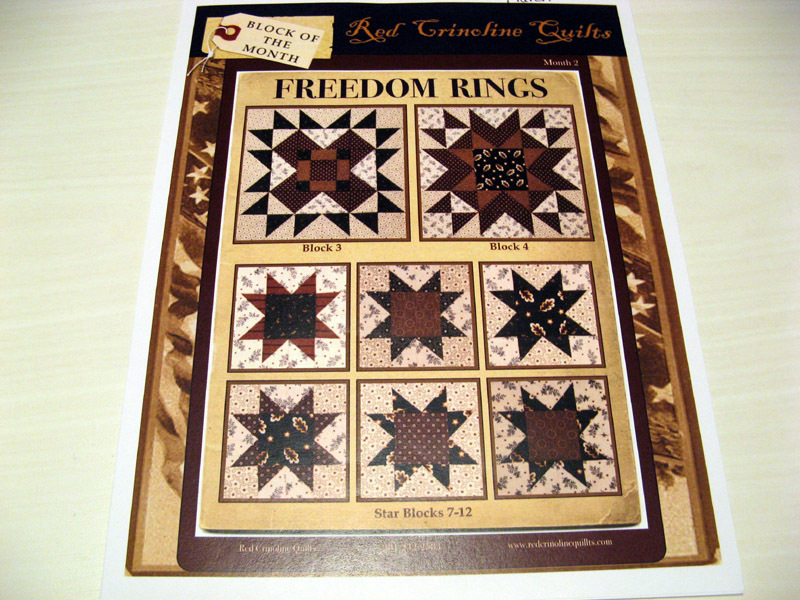 There are several layouts shown in the free pattern except this one. 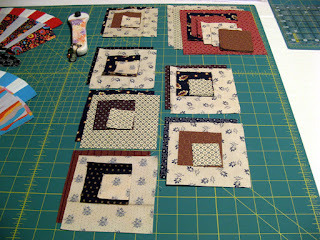 Bonnie showed it during the workshop and since I have such a scrappy set of blocks this layout seems quite appropriate. I'm not certain of the finished size yet. I have to get projects off the design wall for room to play! 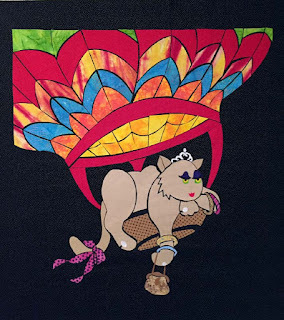 I am working diligently on my February UFO. 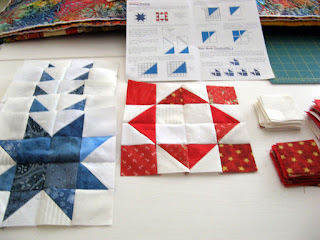 I have the blue blocks done and stitching now on the red blocks. Konstellation and Krown is starting to take shape. 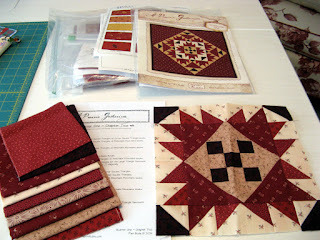 I hope you check out more projects through the links today at Patchwork Times. Congratulation Denver Broncos! It was somewhat unexpected play by the Carolina Panthers in my opinion. What did you think about the commercials and the halftime show. Like Bruno Mars and the Doritos commercial topped them all! This week I have touched on almost every project I have in work. It is a bit hectic having so many things going on, but it is a good chaos. 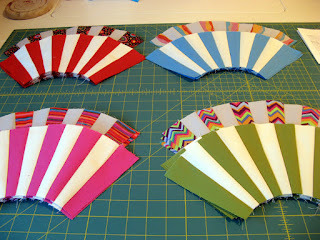 I have been trimming the many HSTs that will be used in Winning Combination...which thanks to Janet O...has a "K" name. Kutarug fits perfectly! You will be seeing this project for quite sometime as I work on the 936 2" HSTs. Konstellation and Krown is my February UFO that holds top priority under the needle right now. 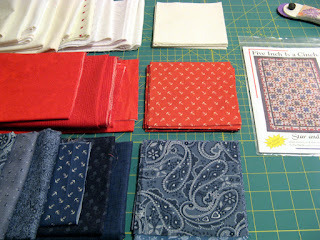 The start is 5" squares of two main fabrics; in my case blue and red. 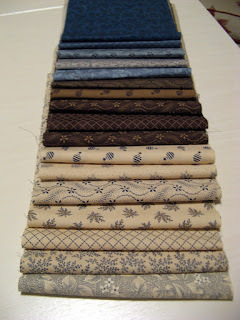 Along with 5" neutrals. Then the trim down to 4 1/2". I am in the process of trimming down with the reds to finish. Next comes dividing the the unit into four equal pieces which become two smaller HSTs and one each of the background and main fabric. 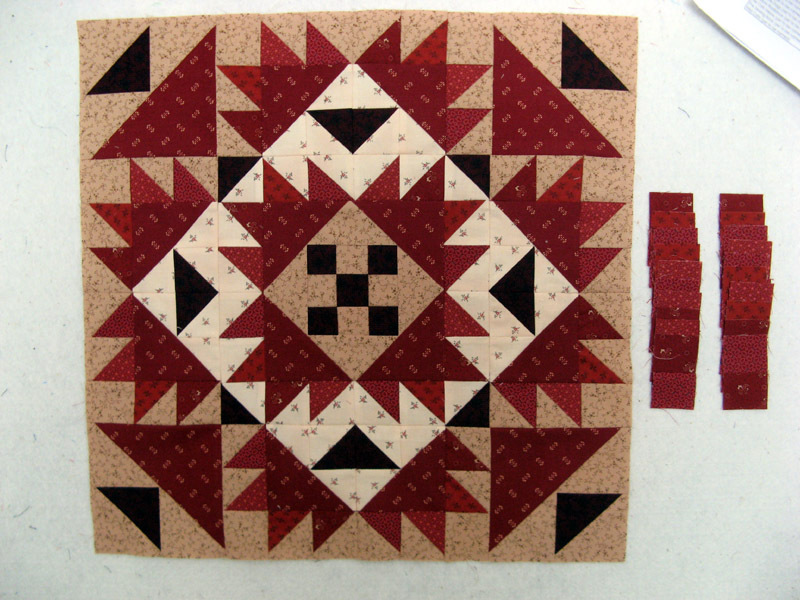 My sample has an error in the layout which I'll be certain to watch out for when the blocks, two different types are assembled. (It's the white solid block in the red block upper left that should be red.) I should have this project close to done by the weekend. 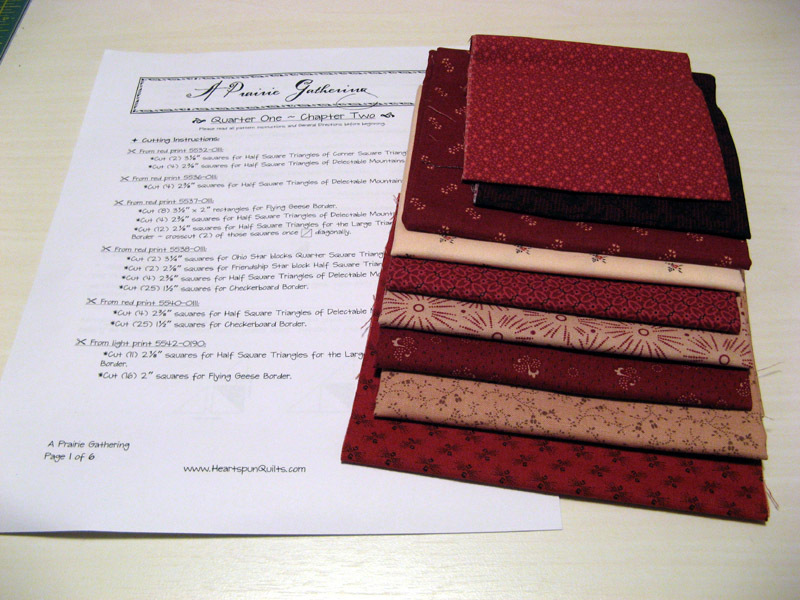 Konstitution Month 2 HSTs are prepared and ready for stitching. I have several of the units sewn, with more to go. 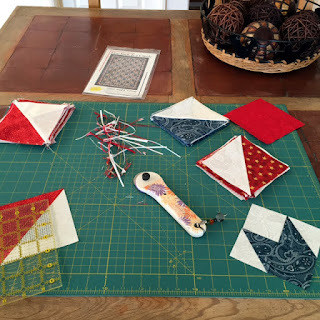 I do love HSTs! 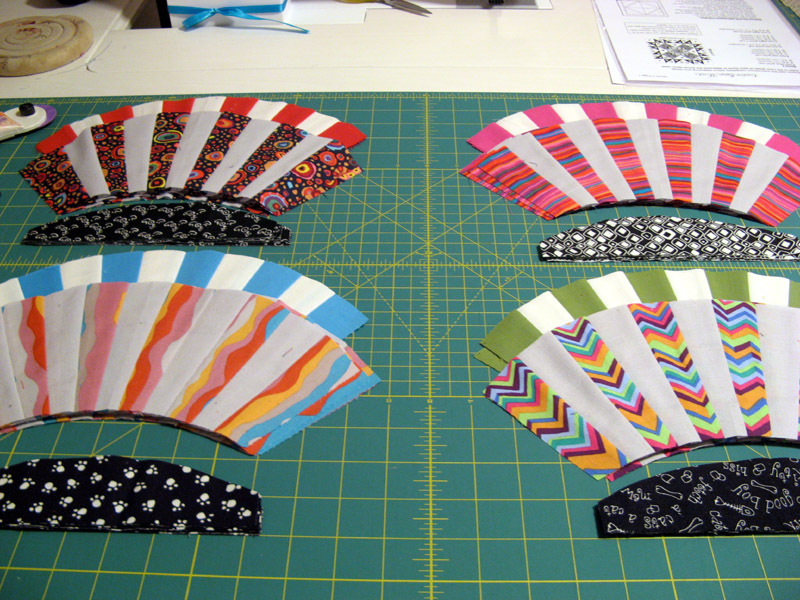 This project takes 720 HSTs that will be done with triangles on a roll paper. The quantity has been divided up into three months since Kerry and I are doing this project as a BOM through the year. Krystals was in my hands during the Super Bowl. I have two of the 17 snowflakes sewn down. 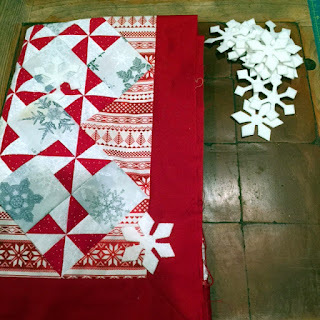 The snowflakes are felted wool and the thread to sew them down is perle cotton. 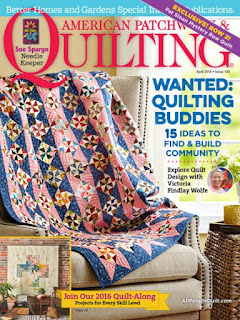 You can just about make out the one in the top left of the quilt. There are two different snowflake designs. Kurosity and Kristoff came home with me from Kerry's on Saturday. 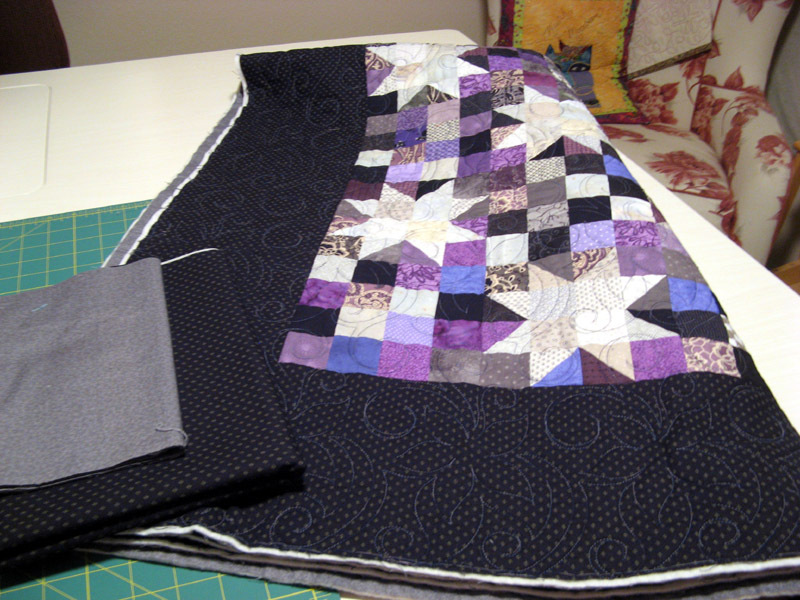 I have both trimmed down awaiting the binding that needs to be prepared yet. Kurosity will have the black print (like the outer border) with the gray for the sleeve. 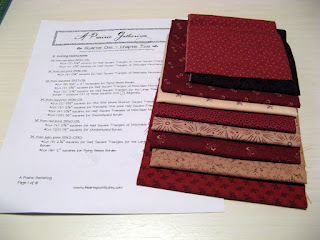 Kristoff will get red binding and the scraps will be sewn together for the sleeve. Kristoff makes me smile...how about you? By the way if you want any information on any of my quilts you can easily read my steps from start to completion by selecting the appropriate label on the right side bar. I started doing this in 2016. 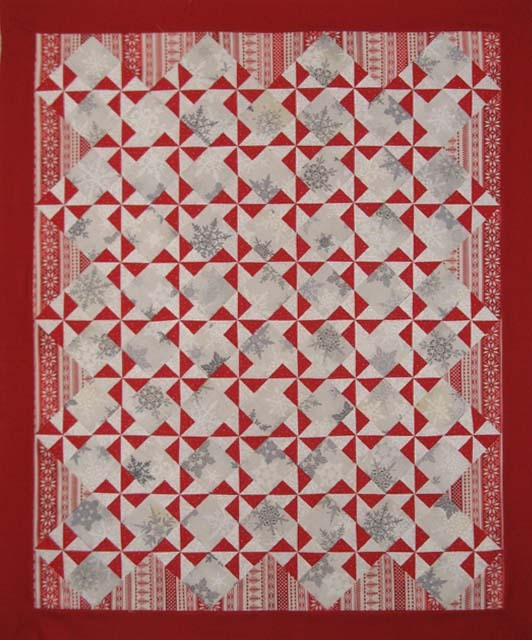 Any quilt that has not been completely finished you'll find a label. Want to know about Kristoff?? ?...just select its label and see everything Kristoff. 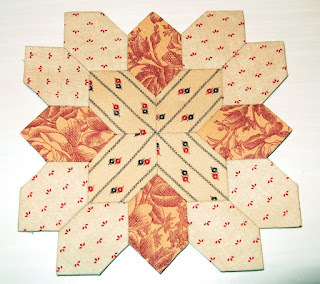 I have the Sunshine Quilt Guild monthly meeting to attend tomorrow night. The program is Schools in Session. 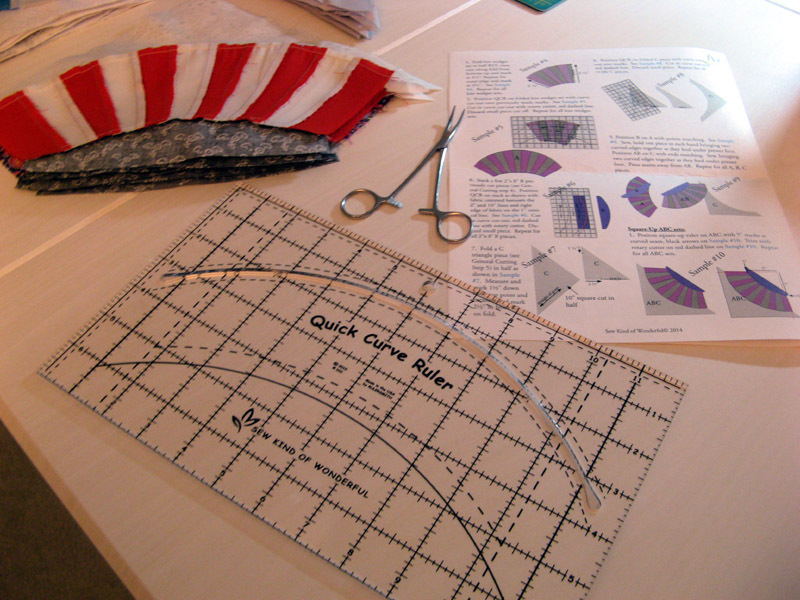 I'll be presenting a 15 minute tutorial on several ways to make a flying geese unit. 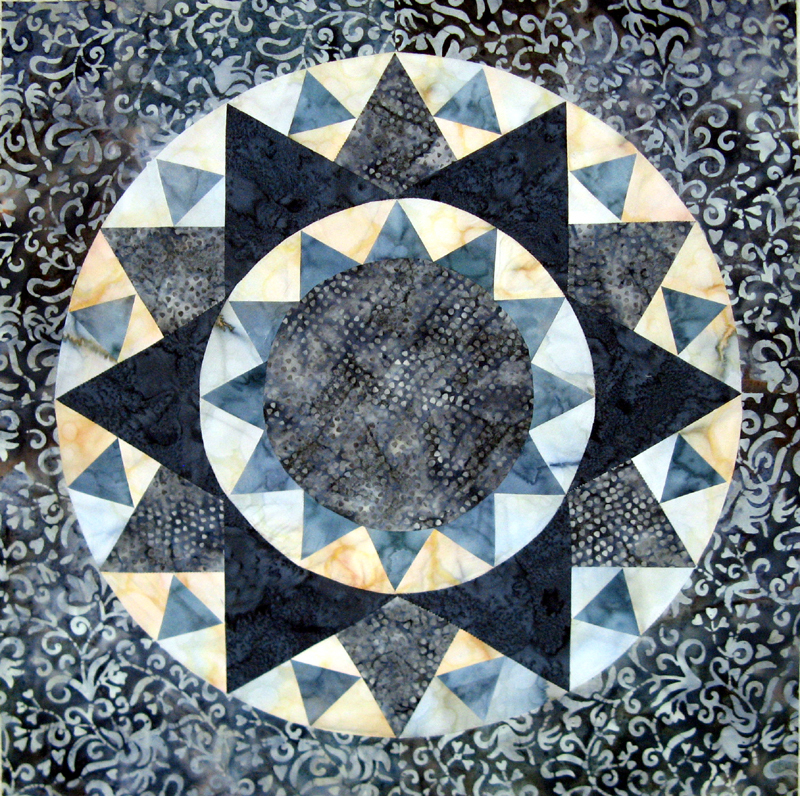 Friday has me in a workshop with Bonnie Hunter sponsored by El Camino Quilt Guild. 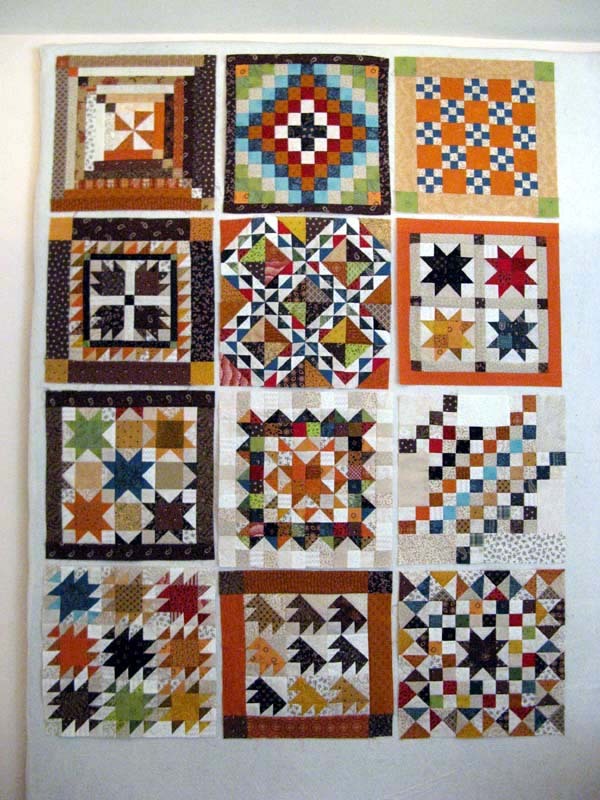 I'll be at Eleanor Burns place, Quilt in a Day, for the day. The project is Scrappy Majestic Mountains. I plan to use a 5" HST instead of the 8" called for in the instructions. 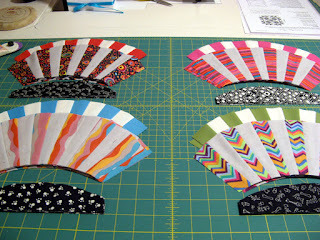 I was in a swap where 5" HSTs were swapped...a perfect opportunity to use them! It will be a smaller project, but I like that idea. 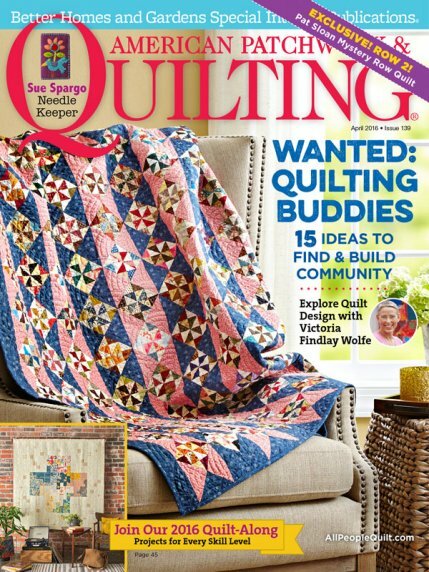 There are a few more projects waiting for me to get back to, but that will be another day =^.^= Take time to see other projects going on in the sewing rooms of other quilters through the links today at Patchwork Times. Komatose is finished. I love this quilt! It is Lazy Sunday by Bonnie Hunter. Yardage long ago claimed =^.^= so nothing in the stats move in either direction. I am making progress though in the used category. Check in tomorrow for what today's stitching accomplished. 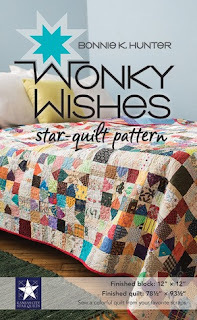 By the way if you want any information on any of my quilts you can easily read my steps from start to completion by selecting the appropriate label on the right side bar. Komatose has 21 including this one. I started doing this in 2016. 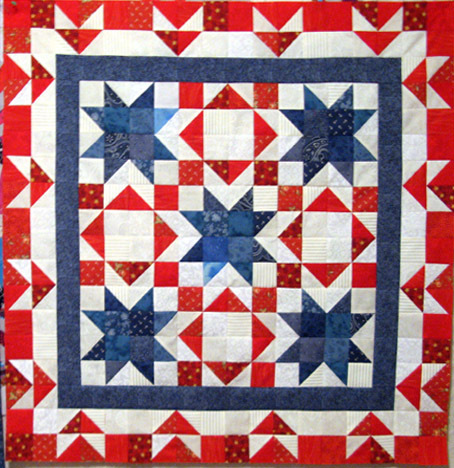 Any quilt that has not been completely finished you'll find a label. Want to know about Kompass?? ?...just select its label and see everything Kompass. I hope you check out more projects through the links today at Patchwork Times. 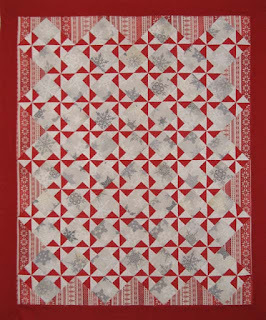 Finished my BOM for Sunshine Quilt Guild February meeting. I still have the "Schools in Session" short presentation to finish. Yippee, the weekend is upon us. I made some progress on my #9 February 2016 UFO. I have many more reds and whites to cut; blues all done. Anxious to get Konstellation and Krown further along. Did I mention the weekend is upon us? 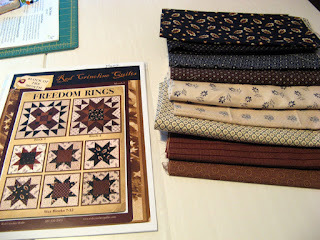 Plans are set to sew with Kerry tomorrow. 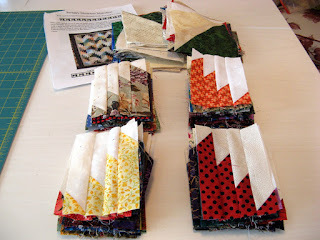 I need to figure out what to work on...there is just so many projects to choose from! 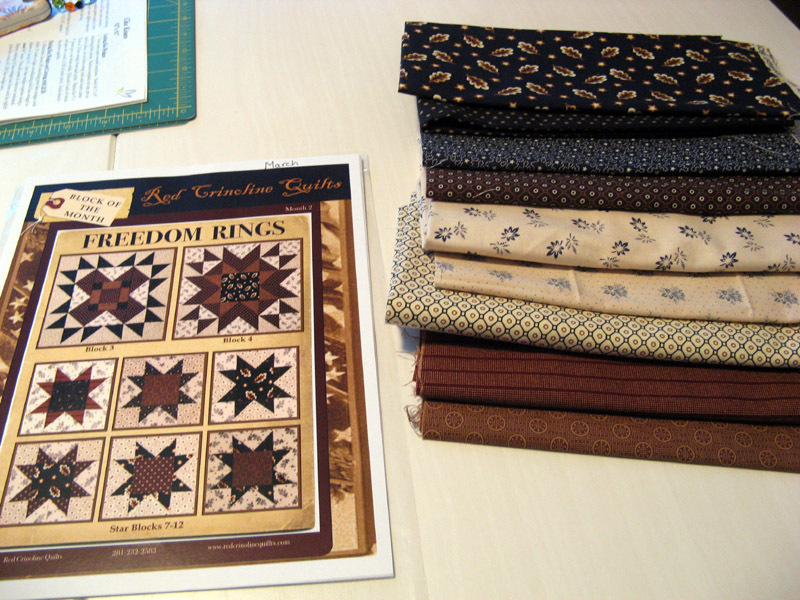 I always look forward to these sewing days. 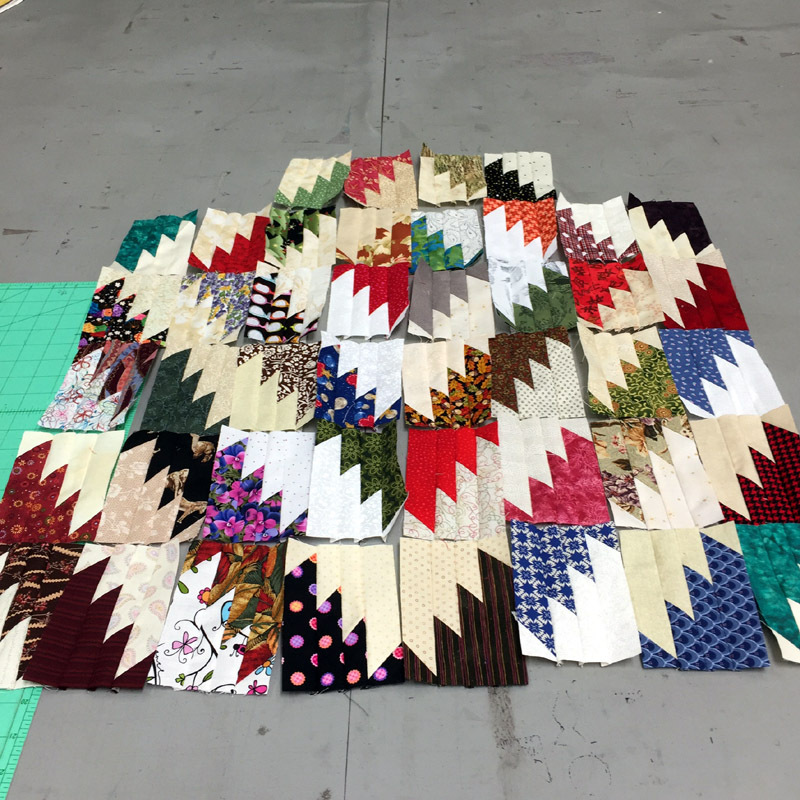 52Quilts selected #9 to be worked on this month from our 2016 UFO list. For me it is Star and Crown. 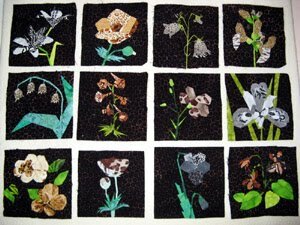 I will be making the small size 38" x 38". 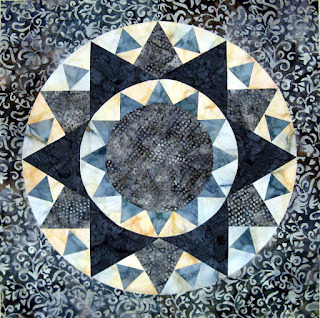 This design is by Pat Speth of Nickel Quilts. It uses charm squares cut up to give the maker correct pieces for construction. 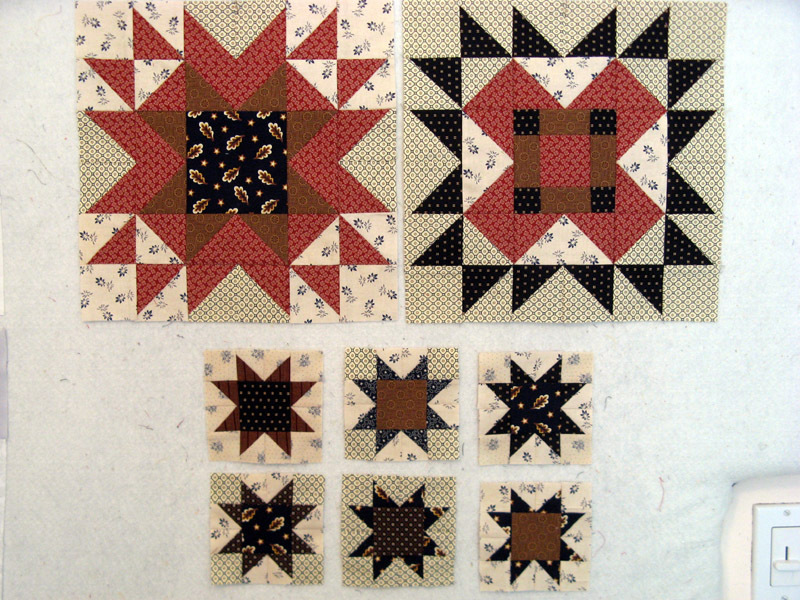 Pat is known for her use of the charm squares. I have taken a workshop from her in the past and made some very successful projects. I'm looking forward to this one that I will be calling Konstellation and Krown. I also have three BOMs to keep up with in February. 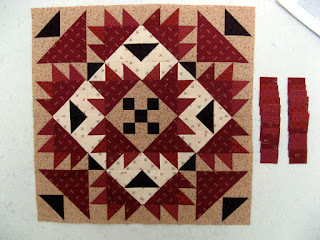 Another month of HSTs for Konstitution, a border round for Kanton Kull, and more star blocks for Kalvery. Sunshine Quilt Guild's BOM for February needs to be stitched up before the next meeting; a week from today. We are also having a member led School Is In Session meeting. 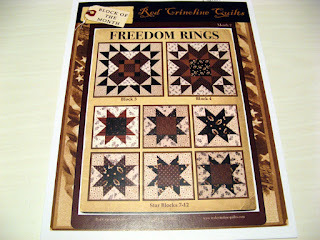 I'll be showing how to make Flying Geese units in several different ways. 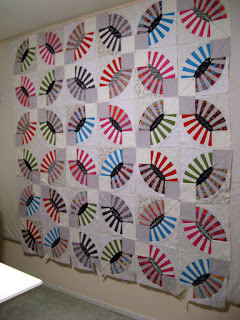 I hope to get more blocks together for Kaffe Kisses, but this will come after the projects with timelines finish. 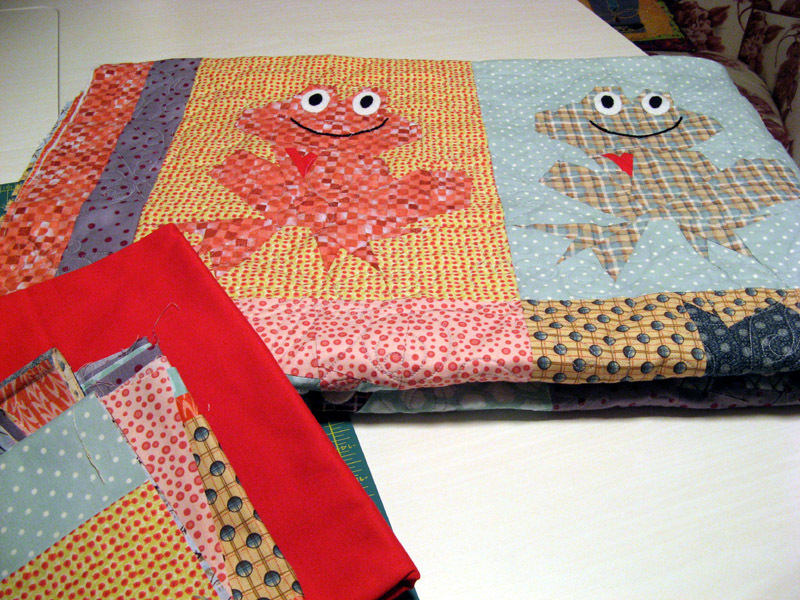 Hand sewing the binding and snowflakes of Komatose and Krystals is also on my "to do" list along with finishing the machine applique on Kastaway. 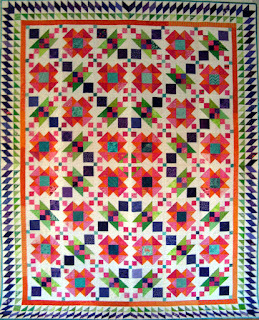 And if all of that isn't enough...with my collection of bonus triangles from various past projects...lunchtime will have me trimming with my Bloc-Loc ruler 2" HSTs for another project that I recently found in American Patchwork and Quilting April Issue called Winning Combination by Tammy Vonderschmitt. I am so excited to have the nearly 1,000 bonus triangles now with a home. Please do help me with a "K" name for this one!